I finally got a new curling iron. But dammit if it wasn't the most trying shopping event ever. And you know I looooove shopping! Any kind of shopping. I started researching my curling iron a couple weeks ago. 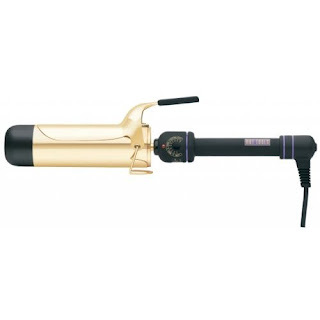 I really wanted a large barrel one and decided that the Hot Tools 2" curling iron was the best value. Anyway, I found it online but it was only $2 off the regular price and I had to pay shipping. I hate to pay shipping but the only way to get free shipping was to spend $50 and I really had nothing else to buy. So then I went to a local beauty supply store. They only had the 1.5" one. Ugh. I couldn't decide. Not to mention they'd end up costing me the same (about $40) because of the tax so really I wasn't saving anything. Another week passed and I was still vascillating. Decided to go to the beauty supply store again and look at the 1.5" and finally came to the conclusion that I really wanted the 2". Then Hunny Bunny and I made a stop at the nearby Target. As we were leaving, HB asked me where my car keys were. Uhhhh. I didn't have them. I didn't even have my purse to put them in.. Besides, he was driving my car. Ummmm. We ran back to the Rack because he had tried on some shorts - maybe he left them in the dressing room. No luck. He ran over to the beauty supply store. Yay! He left them on the counter! Boo. The store was closed and the gate was shut. Double boo. We could see the keys from the window. Steam, then flames, followed by an unhealthy dose of cursing. Who knew I had such a potty mouth? GODD*&)$*!&)! MUTHA%&)!@&#!)!!! SONOFA%&@*)&$">SONOFA%&@*)&$!!! I said. And being the lazy butthead that he is, he had decided to leave his own set of keys at home. With my keys locked in a cage and his keys locked at home you can't imagine how pissed I was. Luckily, my brother was home and was able to bring my spare car keys. I was very tempted to make HB sleep in the garage, but instead he was condemned to the couch. And then I found my curling iron on ebay for $25. YAY for $25!!! ...blessing in disguise! lol ...This is the brand I use as well and I love it ...my barrel is thinner though. I love how you write a post *allegedly* about the hunt for a curling iron but really it's about HB leaving his keys on the counter. HA. ugh to buttheadedness. yay to cursing in tons. and can't wait to the curling iron in action. i can't wield one to save my life. you heard anything about brazilian blowouts. i thinking of trying it. meant cursing in tongues. f.
I have the 1.5, but totally want the 2"! At least you found it for less! i was saying a lot of bad words too. especially the next day when you left your hb there for me to drive around to get the goddam keys and then drop off at home. I did something really similar at the mall once. It took me a few hours to find my keys since I had to retrace my trip all the way through before finally finding in a pile of socks at a department store. Aren't you glad it was him and not you who lost the keys? In my house it tends to always be me.